One reason I started brewing was to be able to drink a beer I really, really like. Something that’s just the way I want it to be. And to me (and many others) that means lots of hops flavor and aroma in an IPA. This experiment tried to determine the best temperature of a 60-minute hop stand in order to maximize flavor. The main result was that a 60-minute hop stand with a temperature of 170°F (76.7°C) tasted the best (out of a set of temperatures ranging from 150°F to 180°F (65.6°C to 82.2°C)). However, none of the hop stands had the increase in hop flavor that I was expecting; instead, the hop-stand beers had fuller-bodied flavor. A follow-up experiment (Hop Stand Experiment #2) looks at the causes of flavor and body in a hop stand. Still another follow-up experiment looks at other techniques that might actually increase hop flavor. I’ve come to the conclusion that 60 minutes is too long of a steep time to get any hop flavor; shorter times (e.g. 10 minutes) are much more effective; it may also be necessary to start the stand near boiling. I’ve created a summary blog post that describes the techniques I’ve found to be useful at maximizing hop flavor and aroma. One technique for maximizing hop flavor and aroma is the “hop stand”, where the hops sit for an extended period (30 to 80 minutes) at below-boiling temperatures. 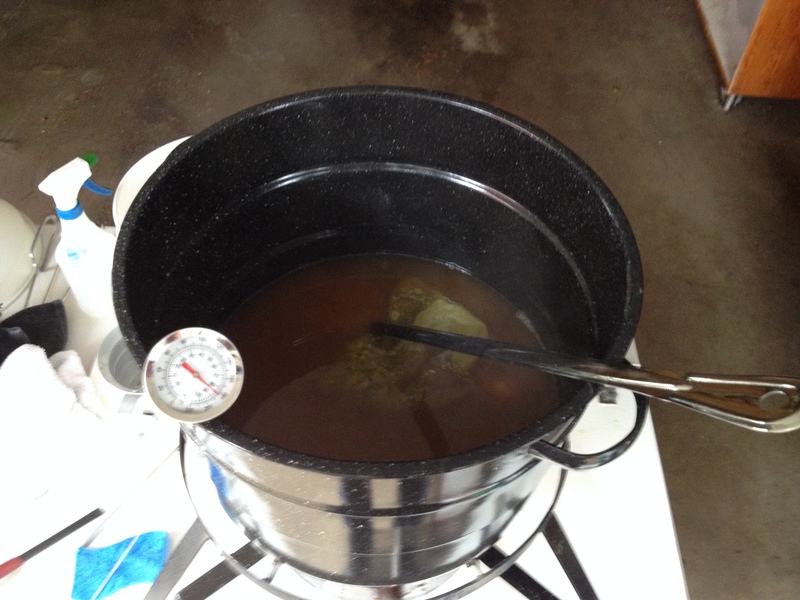 (One question is whether the hops should be added at flameout or after the target temperature has been reached. I decided in this experiment to add the hops only once the target temperature had been reached. This decision may have had an impact on my results.) I was intrigued by an article by Van Havig (now Master Brewer at Gigantic), “Maximizing Hop Aroma and Flavor Through Process Variables“, in which the beer with the most flavor and aroma was the result of both a hop stand for 80 minutes and dry hopping. I tried a 5-gallon (19 liter) batch with 2½ oz (71 g) in a 180°F (82.2°C) hop stand, and I thought the results were quite successful. But I couldn’t find sufficient information on what temperature the hop stand should be conducted at. In a large brewery, I believe that the temperature will very slowly decrease after flameout, but with small-scale homebrewing we should be able to easily and quickly cool to the “best” temperature, maintain that temperature for the full time period, and then cool to pitching temperature. Whatever “best” is, which is what this experiment tried to find out. Lee Morgan at Hot Water Magic conducted an experiment, but at only two temperatures: 200°F (93.3°C) and 175°F (79.4°C). Since his results showed a clear preference for the hop stand at 175°F (79.4°C), I wanted to try a number of different temperatures all below 200°F (93.3°C). The methods of this experiment were simple: Create four 1-gallon (4-liter) batches at different hop-stand temperatures (with a 60-minute stand in each case), and another 1-gallon batch with no hop stand, which I called the “control” or “baseline”. See which batch among the first four yields the most flavor, through a series of pairwise comparisons. See how much effect the hop stand is having, relative to the control, again with pairwise comparisons. Because I restricted myself to four hop-stand batches and one control batch, that limited the temperature range I could try. I decided to go with 150°F, 160°F, 170°F, and 180°F (65.6°C, 71.1°C, 76.7°C, and 82.2°C). All batches were made from the same 1.065 OG wort and 2¼ oz (64 g) of Centennial hops added at 30 minutes, so the only (intentional) difference between batches was in the hop-stand temperature. No crystal malt, no late hopping, and no dry hopping, to keep the focus on the effects of the hop stand. I used ¼ oz of Cascade and ¼ oz of Citra (7 g of each) in each of the four 1-gallon batches, which would translate to 2½ oz in a 5-gallon batch (71 g in 19 liters). Some might worry about the risk of infection with steeping for a long time at below-boiling temperatures. Dave Miller, in The Complete Handbook of Home Brewing, says that “most of the bacteria that are classified as wort spoilers grow best at temperatures from 80°F to 120°F” (27°C to 49°C) (p. 148). According to the Thermoworks food temperature FAQ, “Bacteria thrive between the temperatures of 40°F (4.5°C) and 140°F (60°C). Food should not be stored between these temperatures for extended periods of time.” The minimum temperature used here was above 140°F (60°C), and none of the batches I’ve used with a hop stand (this experiment plus several other batches) have shown any signs of an infection. In short, I think it is never unreasonable to worry about infection, but for a hop stand the risk is negligible. 1.9 lbs (0.86 kg) Briess Light LME to yield target OG of 1.065. This was actually 9½ lbs (4.3 kg) in what eventually became one 5-gallon (20-liter) batch, which was then divided into 5 one-gallon (4-liter) batches. 0.45 oz (12.75 g) Centennial 10.9% AA added at 30 min. to yield 77 IBU. This was actually 2¼ oz (64 g) of Centennial in the full 5-gallon (20-liter) batch. 0.092 oz (2.6 g) Safeale US-05 dry yeast age 8 months, yielding ~0.75 million cells per ml and °P. This was actually 13 grams divided into 5 equal parts. Fix & Fix (An Analysis of Brewing Techniques, p. 68) recommend 0.75M cells per ml and °P. 0.48 oz (14 g) sucrose to yield 2.2 volumes CO2. This was actually 2.40 oz (68 g), divided into 5 equal parts. The 9½ lbs (4.3 kg) of LME was added to 5¾ G (22 liters) of water, yielding 6½ G (25 liters) of 1.053 wort. 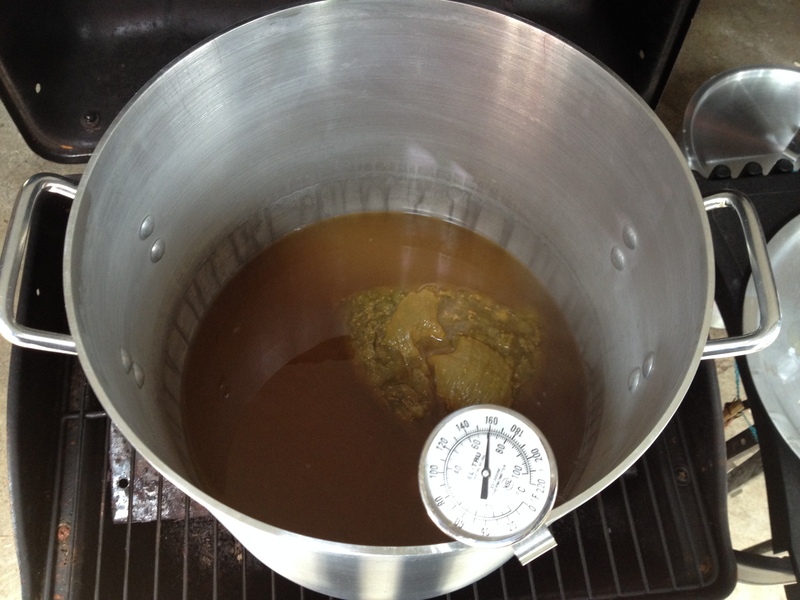 At the end of the 30-minute boil, 5¾ G (22 liters) of wort remained. (I used a more vigorous boil than in my “numbers” post.) The Centennial hops were removed. This wort was divided into 5 equal batches. One batch was set aside, covered, as the control batch. Since I had two burners available, I did the 160°F (71.1°C) and 180°F (82.2°C) hop stands simultaneously (uncovered), then cooled them to pitching temperature. I then did the 150°F (65.6°C) and 170°F (76.7°C) hop stands simultaneously (uncovered), and cooled them and the control batch to pitching temperature. Each batch was transferred immediately after cooling to a 1-gallon (4-liter) container, with 0.70 to 0.87 G (2.6 to 3.3 liters) of wort remaining after separation from the break. The 13 grams of yeast were prepared in ½ cup (120 ml) of 80°F (26.7°C) water for 15 minutes, and this volume of slurry was equally divided amongst all five batches. I shook each batch vigorously to aerate. Airlocks were applied. Time passed. When bottling after 3 weeks with 2.40 oz (68 g) of sucrose divided amongst the five batches, I labeled each bottle with its hop-stand temperature. Yield was 6 to 7 bottles per condition. The measured OG of the 160°F (71.1°C) and 180°F (82.2°C) batches was 1.066. The measured OG of the 150°F (65.6°C) and 170°F (76.7°C) batches was 1.065. I forgot to measure the OG of the control batch, which in hindsight was unfortunate, since it had the least evaporation (due to covering) and hence lowest OG. The measured final gravities (FG) of the batches were: 1.012, 1.014, 1.014, 1.013, and 1.015 for the control, 150°F, 160°F, 170°F, and 180°F batches, respectively. According to the Tinseth formula, there should be 77 IBUs in this beer, for a BU:OG ratio of 1.18. I did the taste comparisons knowing which batch was in each glass. At times I tried a semi-blind tasting (shuffling the glasses around behind cover and waiting until I forgot which was which); these tastings generally confirmed my other, much easier, tests. Here are some pictures of the one-gallon batches. This is the 160°F hop stand, with hops in a mesh bag. This is the 180°F hop stand. 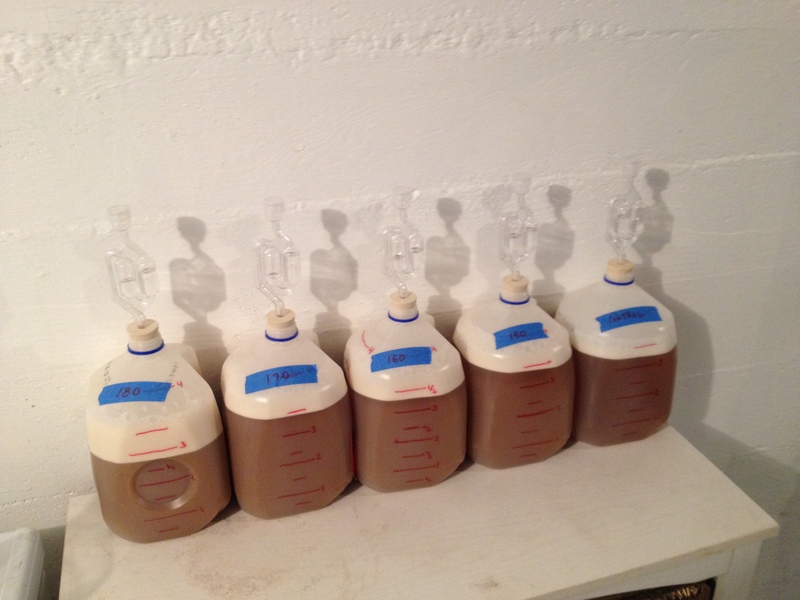 Here are the resulting five one-gallon batches, just after applying the airlocks. Like a police lineup… except they’re all guilty! The difficult job of performing a pairwise taste comparison. Note the color difference, which was much less pronounced when fermentation began. The control was the lightest, 180°F was the darkest. 150°F was lighter than 170°F, although I had to improve my methods and take this picture against a non-brown background, in order to make the color difference more apparent. The table below shows the results of the 15 comparisons. Each row and column indicate a pairwise comparison. The value in each cell indicates which of the two temperatures tasted better. Multiple values indicate multiple comparisons at those two temperatures, which I did to detect possible random variation. I feel that I was able to detect a difference in nearly all cases, although the 150°F and 160°F samples were nearly identical. The taste differences between hop-stand temperatures were usually small but distinct. Multiple tests of the same conditions always yielded the same results, increasing my confidence that the differences were not just random guessing. All of the hop stand conditions tested had a noticeable, positive difference over the control. If these were all the results I obtained, then we’d be done and there’d be no need for a follow-up experiment. However, I was surprised at what the beers tasted like. Prior to running this experiment, I was expecting the hop-stand beers to have a more citrusy flavor than the control, due to the Cascade and Citra hops, but for them to have the same level of bitterness due to the below-boiling temperatures. I expected the flavor difference between the control and the hop-stand batches to be large, and for there to be smaller differences between the different target temperatures. I also was expecting the color of the beers to be more or less the same, with the hop stands possibly darker than the control. What I found instead was that the control was more “dry”, “light”, and “thin/fragile”, and that the hop-stand batches were somehow “sweeter”, more “full”, and somehow more “rounded/robust” with more body. The different target temperatures had different levels of this dry/light or sweet/full character, with the 170°F batch having the most of the “full” character. While I wasn’t expecting the addition of hops to make the beer more bitter, I really wasn’t expecting the addition of hops to make the beer seem somehow sweeter. And the “full”, “smooth” taste was not quite the citrus taste I was expecting. It’s almost as if the addition of hops had the same effect as the addition of more malt. I found the fuller, somehow sweeter flavor more pleasant, and therefore I rated it higher. (Perhaps I should just skip the hop stand and increase my malt levels!) 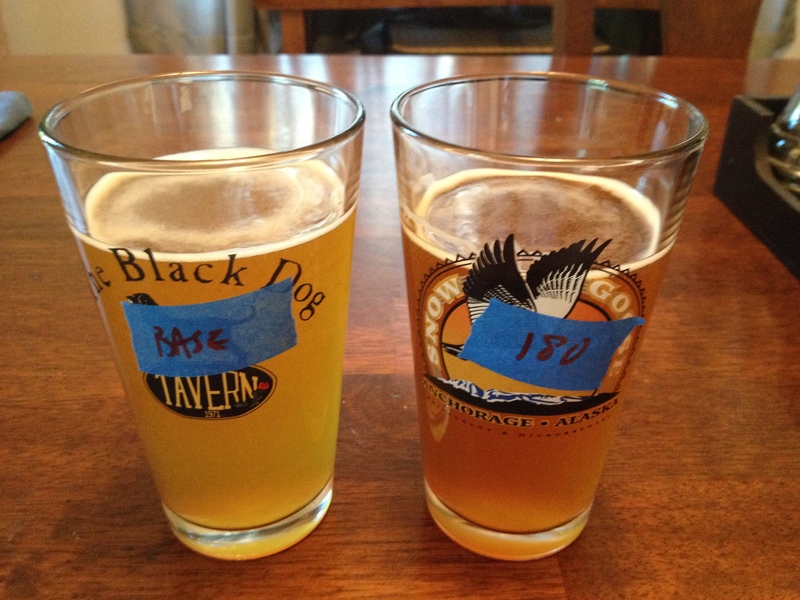 The color did increase more than expected with the hop-stand beers, and darkness correlated with temperature. While the control batch did have the lowest final gravity (1.012) and the 180°F batch had the highest final gravity (1.015), there wasn’t a linear relationship between temperature and final gravity (possibly due to variance in my FG measurements). If the sweeter taste were due to a higher final gravity, then the 170°F batch (FG of 1.013) should have been rated worse than all batches other than the control. It seems that the measured final gravity did not correlate well with perceived taste. My guess is that my FG measurements are accurate to about ±0.001 (I should be so lucky… reading a hydrometer seems like an imprecise science at best), and that the actual FG of the hop-stand batches was 1.014 across the board. The control batch may have had a slightly lower FG (for unknown reasons), or my FG measurement error might be closer to ±0.002. The use of a hop stand was found to be beneficial, relative to the batch without any hop stand. The hop-stand temperature that yielded the best flavor was 170°F (76.7°C). The evaporation during the hop stand increased the gravity of the wort. The addition of hops had little or no effect, perhaps due to the addition of too little hops. If this were the case, I would expect the 180°F batch to have had the most evaporation, and hence the highest rating. Since the 170°F batch was perceived as fuller and sweeter than the 180°F batch, this option is unlikely. The heat applied during the hop stand resulted in nonenzymatic browning (Maillard reaction) of the wort. Again, the addition of hops had little or no effect, perhaps due to the addition of too little hops. According to Fix (Principles of Brewing Science, p. 76), three levels of complexity of nonenzymatic browning can produce a range of flavors including “toasty”, “cooked cabbage” (not due to SMM), “sweet corn” (not due to DMS), “burnt”, “nutty”, and “smoky”. Palmer describes the flavors as being “malty, toasty, biscuity” (How to Brew, 3rd edition, p. 122), with low temperatures associated more with malt and fresh bread flavors. It is possible that the full, sweet perception I had was actually a toasty flavor caused by just the right amount of heat applied for just the right amount of time. This browning would also explain the color increasing with each hop-stand temperature. However, and there’s no better way to say this, but the hop-stand beers tasted “fuller”, but not more “toasty”. And I have no idea if, or how much, nonenzymatic browning occurs in the temperature range of 150°F to 180°F… Palmer says that the Maillard reaction can occur as low as 120°F (49°C) (How to Brew, 3rd edition, p. 122); certainly the color of the batches was affected. Maybe a hop stand really doesn’t add the flavors I was expecting, but the hops oils and resins that are extracted from the hop stand cause a fuller flavor that brings out other flavors from late hopping and/or dry hopping and/or the malt. This doesn’t seem entirely likely, however, since hops are well studied and no previous work has described this effect… although, now that I think about it, I recall that Havig did report that the combination of a hop stand and dry hopping was more effective than the hop stand alone. Maybe it’s important to have some of the hops oils at near-boiling in order to maximize the hops taste, even though this will add some level of bitterness. This might explain why the hop-stand batches didn’t have more of the expected hoppy flavor, but it wouldn’t explain why I rated all of them as better than the control batch. This hypothesis might also be in contradiction with Mogan’s results (in which he preferred the 175°F batch over the 200°F batch). These hypotheses lead to the setup for Experiment #2. In this next experiment, a hop stand with temperature of 170°F will be the control. The hop stand will be covered to prevent evaporation. The amount of hops added in the stand will be increased somewhat from the amount in Experiment #1. To test whether the taste difference is due to evaporation and a higher-gravity beer, the first test condition will be a hop stand at 170°F with no cover (and compared with the control). To test whether the taste difference is due to nonenzymatic browning, the second test condition will be a “hop stand” at 170°F, covered, but with no hops actually added (and compared with the control). To test whether the taste difference is due to interactions with other compounds, two final test conditions will be late hopping for 5 minutes followed by (a) no hop stand and (b) a hop stand conducted at 170°F, covered. These tests will be compared against each other (does the hop stand enhance the hop flavor caused by late hopping?) and against the control (which is better if you can only pick one, late hopping or hop stand?). A number of other questions about the effectiveness of a hop stand will have to wait, since I can only brew five one-gallon batches in one brew session. This entry was posted in Uncategorized and tagged beer, hop stand, hops flavor on August 6, 2014 by Alchemy Overlord. Great experiment! I work with Tiffany at metro and she passed this along. Great stuff! I’m on the board of the Oregon Brew Crew and would love to share this with our membership if that’s ok. By the way, you should join the OBC. You’ll find lots of fellow beer nerds like yourself! Thanks! I’d be happy for you to share it… it’s probably a small audience who will enjoy this kind of stuff, and it sounds like the OBC is a good target demographic. My summer is busy with summer stuff, but I hope to join OBC in the fall when I have a little more time.